With a dazzling spectrum of designs used to advertise the capital's transport system, for more than a century women have been shaping the way London is perceived. Yet the identity of many of these female artists has been hidden. Often they would not sign their work, or just used initials. Other pieces were subsumed under the name of an advertising agency. Now Poster Girls, an exhibition of work by women at the forefront of graphic design, is to go on display at the London Transport Museum in Covent Garden. Here are some of the artworks by women who influenced the London brand. At the beginning of the 20th Century, the opportunities for female illustrators were generally limited to book and magazine illustration. 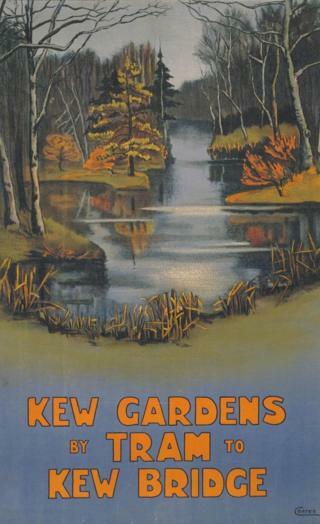 The first known poster by a woman to appear on the transport network was Kew Gardens by Tram, by Ella Coates in 1910. She signed her work without her first name, making it impossible for passers-by to realise the artist was a woman. Between the 1920s and 1930s many more female artists began to design posters for London Underground and London Transport. New social and political freedoms after the war, combined with easier access to art education, meant that becoming a designer was for the first time seen as a viable career option for women. But male designers were still paid more and achieved greater fame than their female colleagues. One woman who bucked the trend was Laura Knight. Encouraged to paint by her mother, Knight first went to study at Nottingham School of Art aged 13 and by the time she was 15 she was teaching some of her mother's art students. She was made a dame in 1929 for her services to art and in 1936 she became the first woman to be elected to the Royal Academy. During World War Two she became an official war artist. Aged 69, she was sent to cover the Nuremberg War Crimes Trials. She died in 1970. 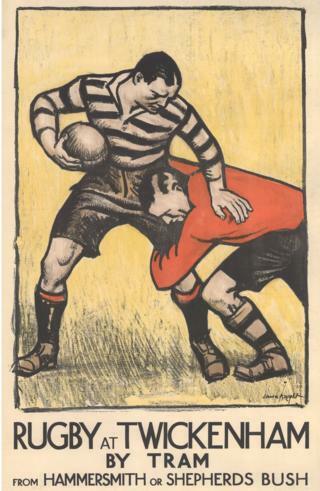 A lithograph print of her Rugby at Twickenham poster sold at Christies in 2012 for £4,750. The year 1925 also saw the work of Dora M Batty used by the Underground Group, promoting trips "from country to the heart of town in 30 minutes". Batty often depicted women wearing the latest fashions. This poster of a modern woman with cropped hair and a patterned outfit is one of three that promote leisure-time pursuits made easy by the Underground. Batty was one of the most prolific, and underrated, designers of her era. She produced more than 50 designs for the group and London Transport, as well as designing textiles and ceramics and illustrating books. Although her work was often reviewed in contemporary magazines, she was never given the same status as her male colleagues. As well as being an accomplished painter, Doris Zinkeisen had a successful career as a designer of costumes and sets for the theatre and the newly emerging British film industry. Her acquaintance with people such as Noel Coward and Anna Neagle lent a glamour to her work, helping her to attain important commissions including murals for the liner Queen Mary. During the 1930s, Zinkeisen produced a range of posters for the mainline railway companies, often depicting historical themes. 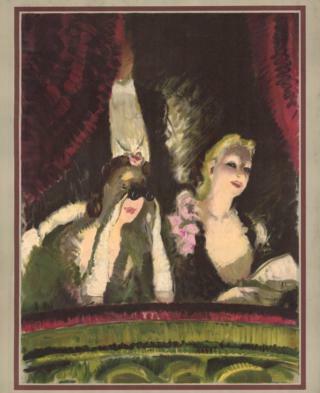 The painting of two women at the theatre was her only work for London Transport. Although printed, it wasn't issued due to the outbreak of war in 1939. She was also a war artist and entered Belsen in 1945. Two of her paintings of the concentration camp hang in the Imperial War Museum. During World War Two, publicity for leisure was replaced by public information posters. Many women were doing war work and fewer worked as poster artists compared to the previous two decades. 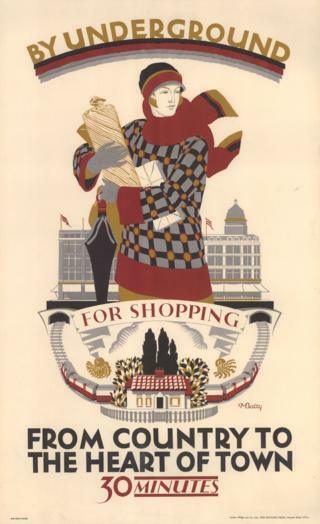 But by the 1950s, London Transport was once again employing female designers, such as Sheila Stratton. Her strikingly modern design, from 1954, is among the most innovative posters published by London Transport during that decade. By the 1960s, posters had moved from the bold designs of previous decades to a much more illustrative approach. Dorrit Dekk was a graphic designer, printmaker and painter who began her career in the post-war years at the government's Central Office of Information, where her public information posters conveyed such messages as "coughs and sneezes spread diseases" or "bones are still needed to make glue". 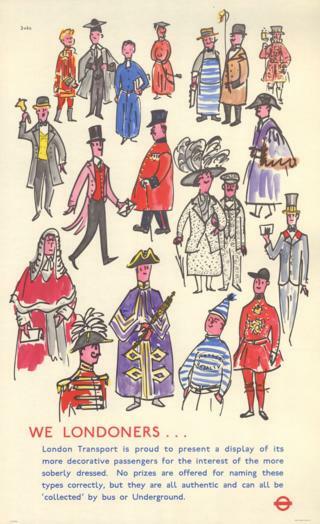 This 1961 poster by Dekk illustrates a wide variety of London characters, ranging from a fishmonger to the Pearly King and Queen. Born Dorothy Karoline Epstein in Czechoslovakia to a Jewish family, Dekk studied art in Vienna before moving to London during the rise of Nazism. Dekk worked for the Women's Royal Naval Service, as a radio intelligence officer in the top secret "Y" service, intercepting the German military's encrypted messages to their E-boats patrolling the Channel. After the war she became known as the "travel queen" for her work with Air France and P&O, as well as London Transport and British Rail. 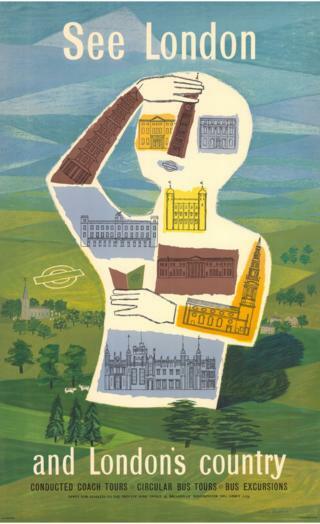 During the late 1980s London Transport began a fine art poster commissioning programme to fill unsold advertising spaces on the London Underground network. 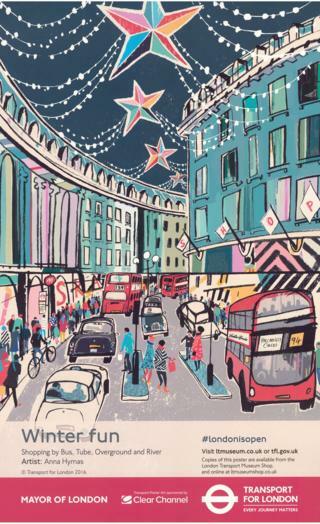 These Art on the Underground posters were commissioned directly from artists. 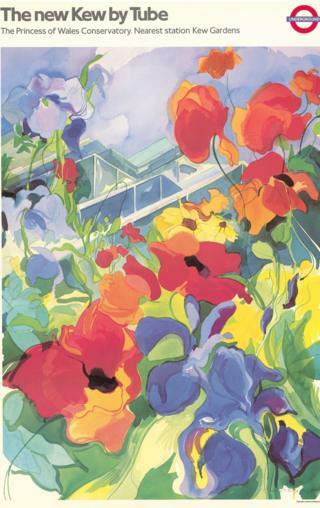 Jennie Tuffs designed seven posters for London Underground between 1987 and 1999, including this design to promote the new Princess of Wales Conservatory at Kew Gardens. 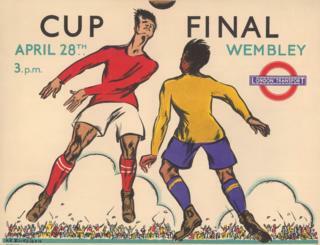 It became one of London Transport Museum's best-selling posters. Anna Hymas was commissioned to create four posters promoting winter attractions to both tourists and locals - including Winter Fun (below). These formed part of a wider campaign, #LondonIsOpen, led by the mayor's office "to show that London is united and open for business, and to the world, following the EU referendum". Sam Mullins, director of the museum, said the poster collection "provides an opportunity to reflect on the changing social, economic and political conditions that affected women's lives and work over the last century - which is rather fitting as we approach the centenary in 2018 of votes for women." You will be able to see more of the images on BBC News Online next week. The exhibition opens at London Transport Museum on 13 October, from 18:45 to 22:00, and daily after that.